Extroverted Intuition is the most visible aspect of her personality. “If I had a world of my own everything would be nonsense,” seems the sort of thing a bored, curious intuitive would say as they try to explore every possibility no matter now far-fetched. 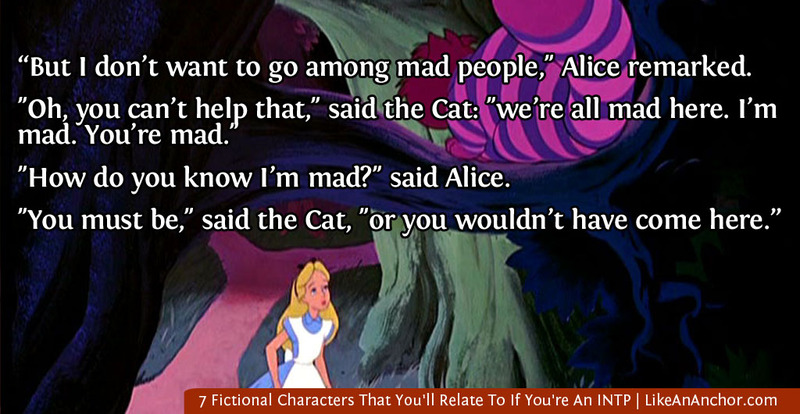 As Alice goes through Wonderland, she’s constantly testing the different aspects of the world and asking questions. If we accept Wonderland as a glimpse into Alice’s introverted side, it seems very much like we’re seeing her use Introverted Thinking trying to try and make sense of all her ideas. Supporting this is her lament that she “never stopped to reason.” She recognizes that her Ne curiosity tends to get her in trouble before her less developed Ti has a chance to catch up. 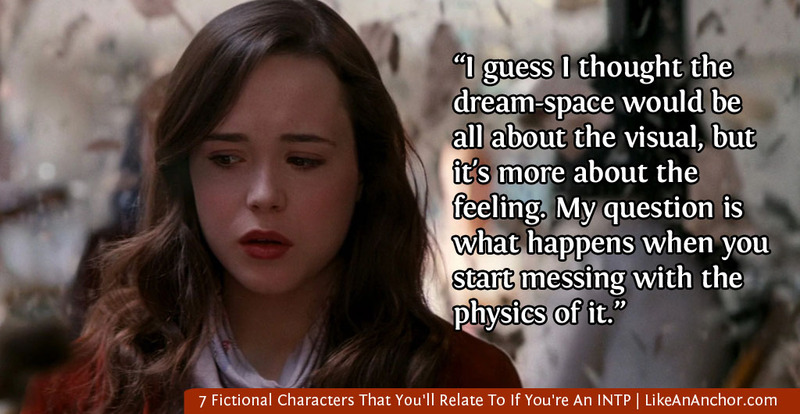 There aren’t a whole lot of female INTPs in fiction, but I think Ariadne from Inception is one of them. Like many people who use Introverted Thinking comfortably, she’s logical and loves to solve puzzles. She’s also quick-thinking, rational, and analytical as well as very creative. And while most of her processing takes place inside her head, she’s not shy about sharing what she thinks when she needs to. Ariadne says her creative process works, “like I’m discovering it.” She uses an intuitive process Personality Hacker calls “Exploration” as her way of interacting with and shaping the world around her (including dream worlds). You can also see an INTP’s tertiary Introverted Sensing in her concern for detail and her respect for the value of past experience (both her’s and others’). 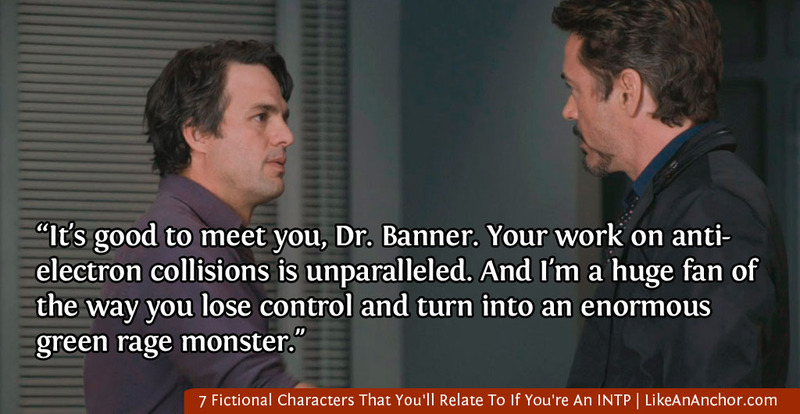 Bruce Banner is an absent-minded professor sort of INTP. I was torn between putting Sherlock Holmes or Bruce Banner on this list, but I went with Bruce mostly because I’ve already written so much about Sherlock. Besides, I like the idea of there being superheroes that each Myers-Briggs type can relate to. Like many INTPs, Dr. Banner is an introspective troubleshooter. He follows an internal set of rules that he’s constantly refining based on new information and experiences (this is pretty common for TP types). His Extroverted Intuition comes out in his excitement over new ideas and his eagerness to test out theories (sometimes too eager, as his green friend can testify). Real-life INTPs might also relate to his ability to step outside rules, traditions, and his own personal feelings in order to come up with innovative solutions and inventions. 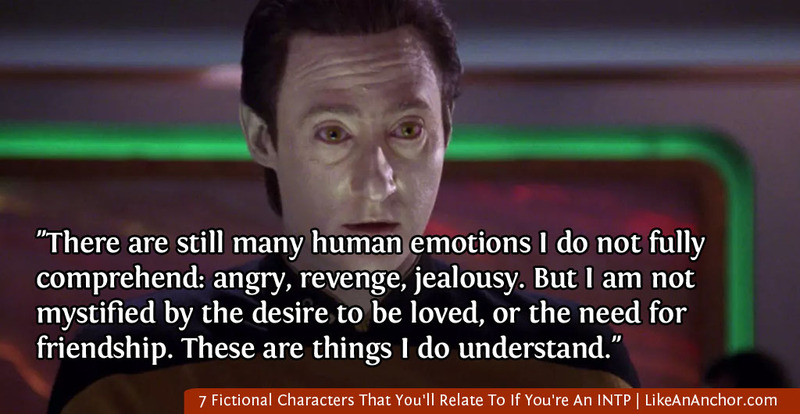 You might have seen INTJs described as the “coldest humans” and INTPs as the “warmest machines,” probably with a picture of 7 of 9 as the INTJ and Data as the INTP. While this description is overly simplistic, I think it’s kinda cute and it’s a quick way to get people thinking about how the two INT types differ. INTPs often come across to other people as being odd. We often see them as a sort of absent minded professor — the friend we enjoy being around who just doesn’t quite “get” other humans. An INTP who feels out of place in a society where people are “hardwired” to think differently than them, and who keeps making efforts to connect anyway, might relate to Data’s quest to fit in with humans. They might even be surprised to learn that people really do appreciate them just the way they are, much like Data’s friends appreciate him. Flavia Sabina de Luce’s story begins in a lovely book called The Sweetness At The Bottom of the Pie. This mystery series by Alan Bradley features a precocious 11-year old sleuth fascinated with chemistry and death who solves murders in and around Bishop’s Lacey in 1950s England. She’s one of my favorite fictional characters, and I highly recommend the books for readers of all ages, but especially to young Thinking-type women. The books are written in Flavia’s voice and you get to know her personality from the inside-out. She’s intensely independent and devoted to acquiring all sorts of knowledge. Clever, logical, and easily bored, she uses an abandoned chemistry laboratory in her sprawling ancestral home and turns herself into an accomplished amateur chemist. 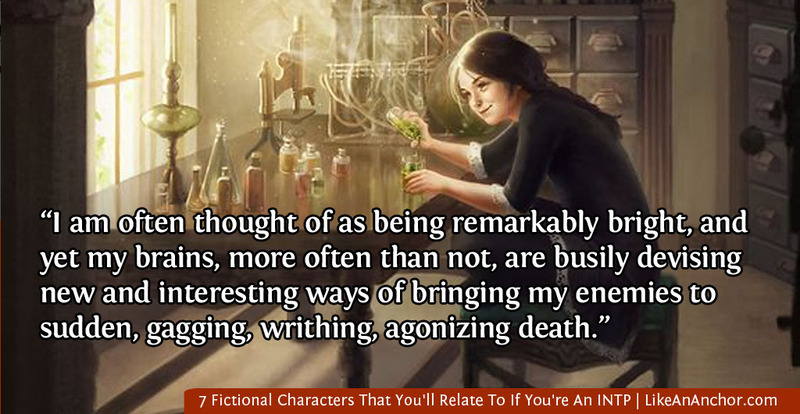 I’m quite certain she’s a young INTP, and the author does a fantastic job of making her an engaging, layered character. Credits for the fanart featured in these images: “Flavia de Luce” by VanaVanille and “Flavia de Luce” by Shilesque. Quote from The Weed That Strings the Hangman’s Bag by Alan Bradley (2010). Image: Fanart by Shilesque. 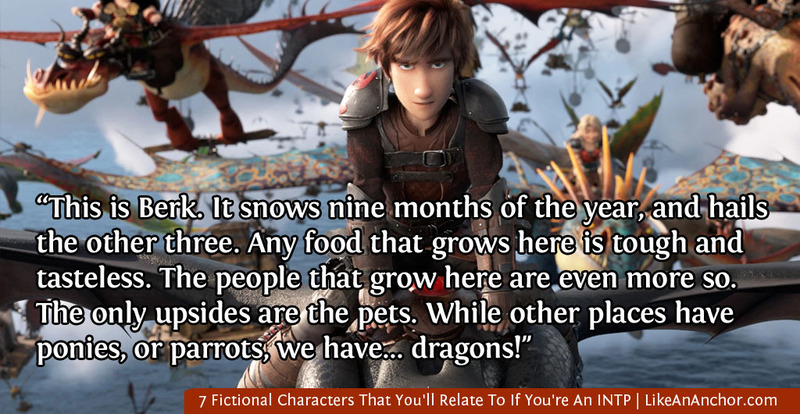 Hiccup from the How To Train Your Dragon films is most often typed as either an INTP or INFP. Hiccup’s intuitive side is pretty easy to spot. Even in the real world, Intuitives make up only 30% of the population so it’s not unusual that he feels out of place in Berk where real-world, physical skills are prized. Hiccup is a dreamer and inventor who, after meeting Toothless, envisions a different kind of future for humans and dragons. If you interpret Hiccup’s actions as being based on what feels authentic to him, that can make him see like an FP type. But I go with him as a TP type because I think he tends to make decisions based more on “what makes sense?” than on “what feels right?” While he does care about other people, Hiccup doesn’t primarily act based on their opinions and beliefs. He researches, investigates, and then takes the course of action that seems most logical to him (even if he can’t always explain it logically to others). It’s also worth noting, since Hiccup cares deeply about other people and dragons, that whether or not someone has feelings/emotions isn’t really a good indication of whether they should be typed as a Thinker or Feeler. Feeling and Thinking are both rational decision-making functions. They don’t determine whether or not you have feelings; they only describe how you choose to act on those emotions. 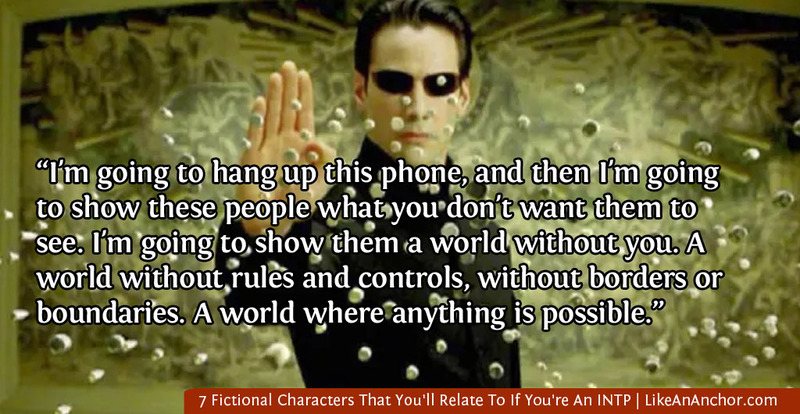 Susan Storm has already written a beautiful summary of why Neo is one of the greatest INTP movie heroes, so I’ll keep mine brief and suggest you click over to Psychology Junkie and read her post. Neo’s drive to understand the universe, his relentless search for answers, and his search for mind-expanding knowledge is a hallmark of Introverted Thinking. Like many INTPs, he isn’t interested in just following the crowd or letting some outside authority tell him what to think. He’s an independent thinker and acts based on what makes sense to him, not what others tell him to do. What did you think of this list? 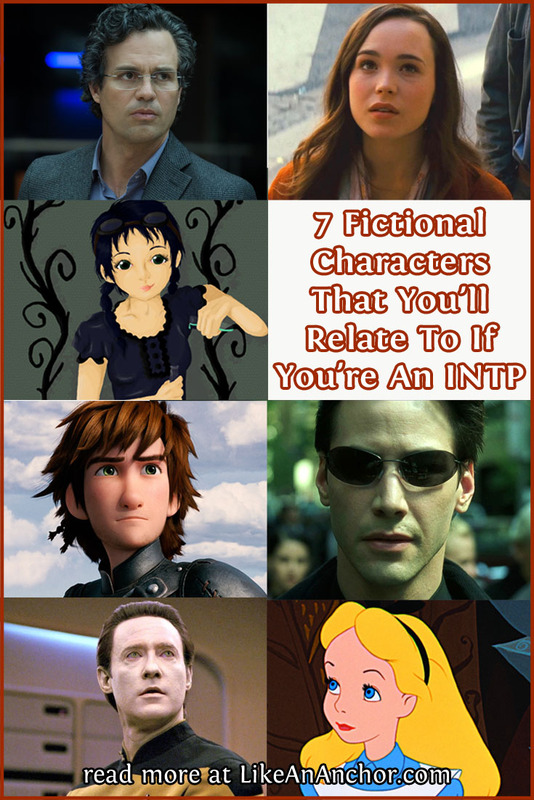 If you’re an INTP, which fictional characters do you relate to best? Is there anyone you’d add to or take off of this list? I’d love to hear your thoughts! I have seen both Captain Marvel and Wonder Woman, but I’m not quite sure how I’d type either character. I really liked both films and characters, but felt like I had a hard time getting a read on their types, especially Carol Danvers. I think she’s an Introvert and a Thinking type, but I’m not sure beyond that.